The six-hole, 3,033-metre drilling program focused on copper-zinc targets. Drilling was supplemented by borehole electromagnetic surveys performed by Crone Geophysics. The best hole was MCF-18-98 that cut 26.4 metres of massive sulphide grading 2.1% copper, 3.4% zinc, 5.5 g/t silver and 0.2 g/t gold from 707.3 metres downhole. It was drilled 155 metres down-dip of the discovery hole. Another notable hole was MCF-18-96 drilled 45 metres down-dip from the discovery hole. 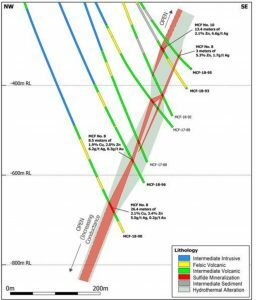 It intersected 11.5 metres of massive sulphide that returned 8.5 metres of 1.9% copper, 2.0% zinc, 6.2 g/t silver, and 0.3 g/t gold. This hole indicates excellent continuity of geology and grade at McFaulds No.8, according to Noront. Noront says the copper grade is richest near the base of the VMS (2.0 metres of 8.9% copper and 11.4% zinc). Immediately below the copper zone is a high grade zinc zone (3.5 metres of 14.2% zinc). Readers might enjoy the latest corporate presentation at www.NorontResources.com.